Minister for Health Mary Harney claimed at the weekend that the International Monetary Fund (IMF) would enforce spending cuts if public expenditure is not reduced by at least 30 per cent. The debt of the 26-County state has risen from 25% of its gross domestic product to 75% in just two years, according to recent figures. In the face of global economic recession, the borrowing has been used to sustain the wealth of a small but powerful elite on which the governing Fianna Fail party depends for support. Minister Harney was one of a number of Cabinet members who publicly backed a dire assessment of the economy made by Minister for Finance Brian Lenihan on Thursday night. Speaking at a business dinner at the Dublin Chamber of Commerce, Lenihan repeated a pledge not to raise any more taxes on the wealthy. “We need to stabilise our national debt, we need to reduce borrowing, otherwise we are on the road to ruin,” Lenihan said. “If we live in denial and continue to borrow to try and sustain bubble-era lifestyles we will condemn our children to a life less prosperous than ours,” he said, indicating that a nightmare budget is on the cards. Harney admitted that the 26 County State is spending 500 million Euro more each week than it is raising in tax revenues. “If the Government hasn’t the capacity to do what’s needed, then others will come in, like the IMF, and overnight they will make decisions,” she warned. Education Minister Batt O’Keeffe warned that public sector pay and social welfare payments would be brought down to the level of other European countries. He said the next few months would “test our mettle as a nation”, but that “the experience of the 1980s shows us that delay makes the problem worse”. He said that as 38 per cent of current spending by the Government was on social welfare payments “it must be reduced”. Sinn Fein Finance spokesperson Arthur Morgan has described Lenihan’s preview of the forthcoming Budget as a promise to make low-paid workers and their families pay most for the recession. “To address the budget deficit he is going to rely totally on savage cutbacks across vital public services,” he said. Health, education and social welfare for the majority are expected to be slashed -- but Mr Morgan pointed out that the highest earners would still benefit from private hospitals, private schools and untaxed private wealth. 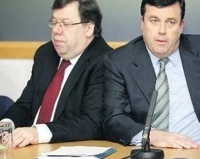 “It is absurd for Minister Lenihan to suggest that the wealthiest can pay no more and should not be required to do so. “Income distribution is grossly distorted in this State so it is natural that higher earners pay collectively more tax - but they are still not paying their fair share. “Far from it. There are still a host of reliefs and avoidance schemes that the super-rich employ very successfully to avoid paying tax. “There is only one top percentage rate for income tax which means that someone on 37,000 Euro per annum pays at the same percentage rate as someone on 1 million Euro per annum. Top earners also own most of the State’s wealth in assets and pay no tax on those assets. Mr Morgan said there should be a third income tax rate of 48% for earnings in excess of a hundred thousand Euro, and that discretionary tax reliefs should be standardised, two moves that could raise 1.5bn Euro.